OAEI has been launched by system developers who wanted to gather more knowledge about the behaviour of their matchers. Hence, many organisers are system developers and most of them want their systems (or the systems developed in their teams) to participate to OAEI evaluations. There was no reason to prevent them from participating as it provides more results and as there is not so many volonteers for running OAEI. Additional rules were introduced for increasing fairness. In addition, we decided to publish, for transparency's sake, a declared "conflict of interest" matrix, disclosing openly the involvement of organisers or their teams in participating systems. The following matrix features all systems which participated the same year that its developers were organisers. Hence there are organisers, developers of systems which participated in OAEI, that are not flagged as such because they did not participate the same year they organised. Systems appearing in italics were not directly developed by that organisers, but come from the same team. 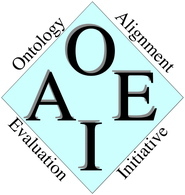 The matrix can be easily obtained by crossing the names in the OAEI synthesis paper of each year with those of the OAEI track paper of each year.